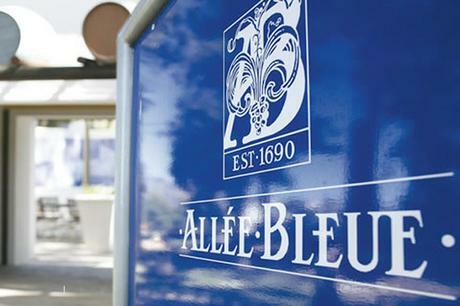 Allée Bleue, a wine estate that celebrates a decade of reinvention this year, is marking that achievement with the introduction of – amongst other things – a new winemaker, a new GM, three new wines and the largest conference and event venue in the Winelands. And two of those wines are pink. Van Zyl Du Toit, the face behind the wine, a man passionate about bubbles. But first a diversion. Have you noticed who supplies the fresh herbs to Fruit & Veg City nowadays? It’s Allée Bleue. And, behind own labels, they supply Pick n Pay as well. They are also a major exporter of peaches, plums and persimmons. And now they have pinched the bubbly winemaker from Simonsig and have the largest event venue in the Winelands as well. Who knew? 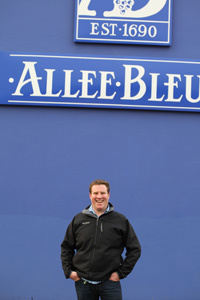 So, invited by them the other day to sample their new wines and see the new space, it was reinforced yet again how serious the German owners of Allée Bleue are about this estate. Its wines have always been distinctive in style – they’ve never been afraid of blends and their entry level Starlette Blanc and Rouge blends have always been good value as well. But Pinotage and Chenin have always been at the forefront of their production and that isn’t changing with their new trio. First up is the unusual MCC – an unusual blend of pinotage and chenin blanc, as above, a combination that very few others use as their base for MCC, whose stalwart base wines are usually pinot noir and chardonnay, of course. The upshot for the 15-month on lees Brut Rosé is unusual and quite a lot younger and more acid than the more established names in the market – the brioche mentioned in the tasting notes wasn’t there for me. But a fruitier dessert-friendly freshness was: when served at the right temperature, properly chilled, it matches strawberry-based desserts (as we were served) fabulously. And at R89.50 from the cellar door, it isn’t over-priced either. But back to the wine and food. The starter and its accompanying Rosé were very fine, perhaps the multi-textured smoked salmon entrée more than the R32 shiraz based Rosé itself. Rosé is very hard to get right, I find. Either bitter and harsh or overly sweet. Getting the balance right, as farms like Newton Johnson, De Grendel and Elgin Vintners do quite well, is by no means a given. Personally, I consider Allée Bleue to be getting close but not quite, yet, the cigar. A bit too much rasp and not enough berry. Their new wooded Chenin Blanc, however, is another story. I am quite of the opinion that a well crafted, passionately produced Chenin Blanc can be more than a match for an equally well-designed Chardonnay. Beaumont’s Hope Marguerite comes to mind, as do the wooded Chenins from Spier and Springfontein. This new Chenin from Allée Bleue can hold its head high in such company and was a great foil for the gently Thai-sauced blackened chicken we were served for main course. A steal at R39. So, in the end, a satisfying next step in the progression Allée Bleue is undoubtedly making towards being on the A list of winelands events venues. Its own bubbly, a very fine food-friendly chenin blanc, a vast range of herbs and fruits, that romantic olive grove outside its new Grand Hall venue and a tangible commitment to quality and excellence in all they do. ← Craft beer: should wine be worried? Craft beer: should wine be worried? This web log is a collection of personal writings on topics that I’m seriously (some would say, obsessively) passionate about – that includes writing (especially words), marketing (especially branding), tourism (especially local), food (especially cheese), drink (especially wine) and cars (especially BMWs). We all have our crosses to bear. If you like the wine and tourism stuff, please visit www.21thingstodo.co.za and www.winetourismsouthafrica.co.za, where some of these articles were first posted.